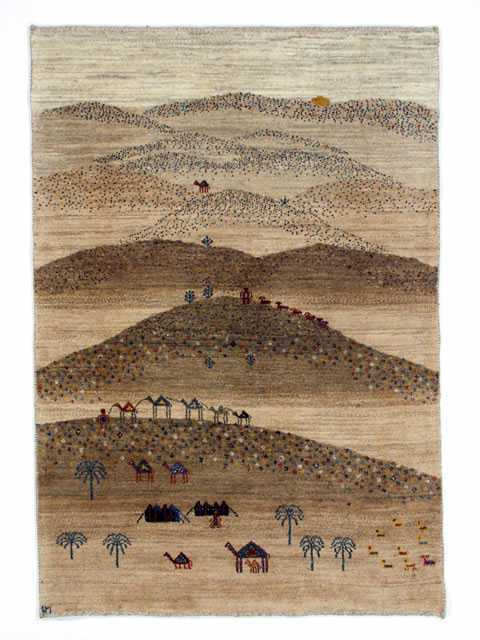 Gabbeh, also spelled Gabbayeh,means a long piled sleeping rug that was made by the villagers and tribes people in the Zagros Mountain area near Shiras Iran. For at least the last 2,300 hundred years people have been making long pile sleeping rugs as their beds. About 20 years ago these got popular with collectors and as a decorator item. The earliest commercial Gabbehs where simplistic rugs woven with undyed wool in shades from off-white to chocolate brown. They were popular and many weavers who were making commercial village rugs switched to Gabbehs. Then Zollanvari a German or Swiss Compny organized the production and we began to see wonderfully creative new style Gabbehs. Size: 6ft. 3in. x 8ft. 10in. This one-of-a-kind piece is handmade by nomads in the Zagros Mountains region of Persia. It features a soft, handspun-wool pile on a handspun wool foundation, as well as all natural dyes and the simple geometric designs typical of an Amaleh Gabbeh. In Farsi (the language of Persia), the word Gabbeh means something raw or natural, uncut or "in the rough". Gabbeh are the world's best-known coarsely woven Iranian tribal rugs. 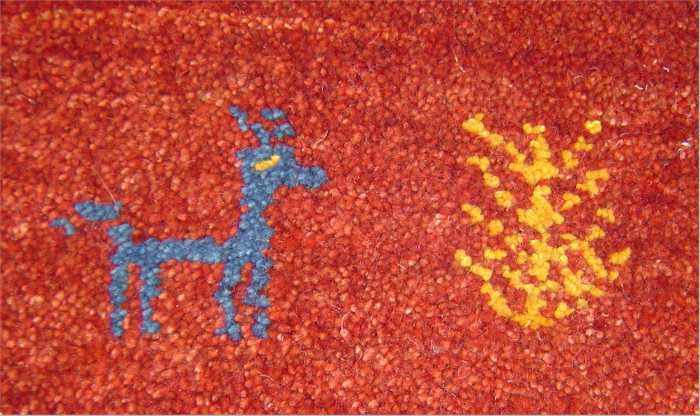 True Persian Gabbeh rugs are made by nomads in south-central Iran and feature hand-spun wool in both the pile and the foundation, as well as all natural dyes, simple and colorful geometric patterns, abstract scenery, child-like representations of people and animals, bright colors, and more. 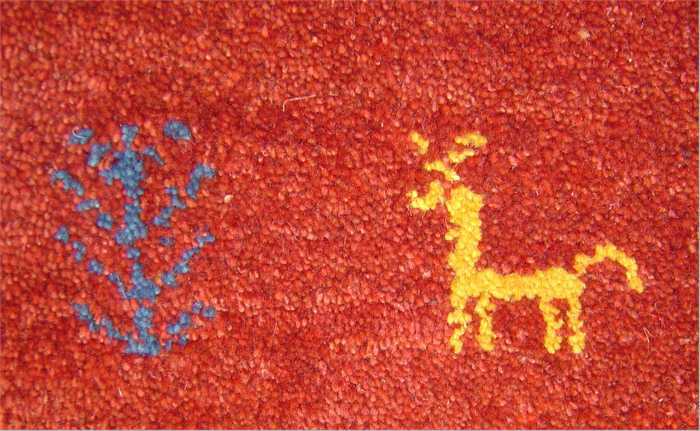 Amalehbaft Gabbeh feature a medium weave in terms of coarseness and knots-per-inch. In general they probably have even less in the way of design than the basic Gabbeh. Because of their tighter weave, shorter pile and simple patterns, these beautiful rugs are a great way to add color to a room without the distraction of too many design elements. 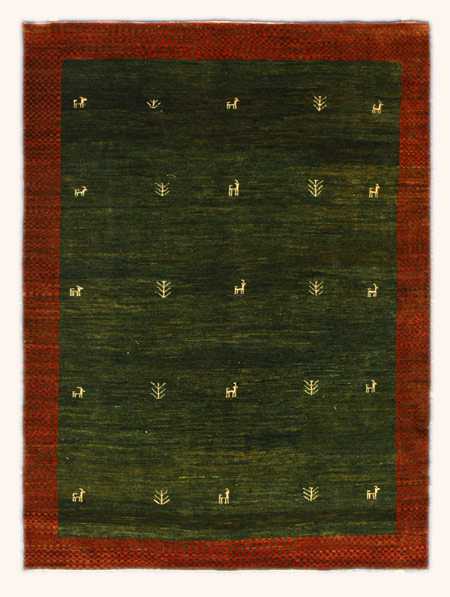 Notes: This is an example of the very best Gabbeh rug made. The wool is hand spun from sheep indegineous to the Fars province of Iran. The color was created by the great dye master Abbas Sayahi from the very best natural dyes. 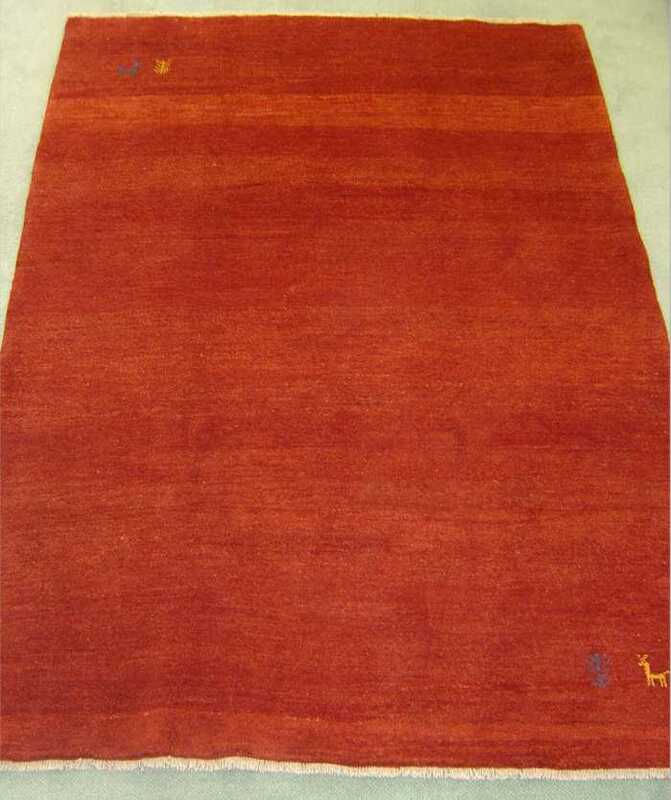 The rug was woven by Qashqai tribal weavers and imported to the United States. Size: 7ft. x 9ft. 6in. This one-of-a-kind piece is handmade by nomads in the Zagros Mountains region of Persia. 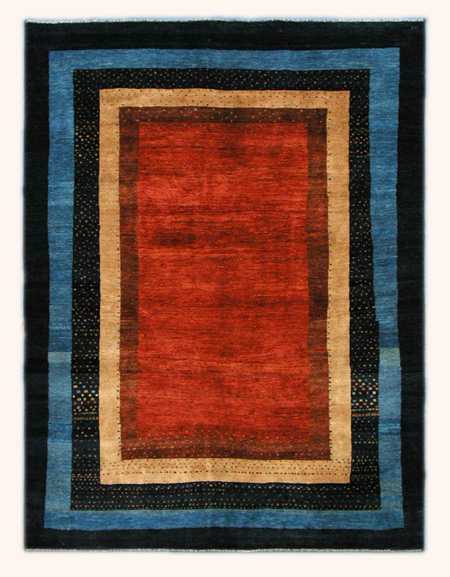 It features a thick, soft, handspun-wool pile on a handspun wool foundation, as well as all natural dyes and the tribal artwork characteristic of Basic Gabbeh. Basic Gabbeh typically feature a fairly coarse weave, with few knots per inch and a thick, plush wool pile. They usually have very little in the way of design elements with large open fields and simple geometric shapes, bold, bright colors, and tribal drawings of people and animals.